Taiwanese singer/actor Jay Chou (周杰倫) is preparing to commence filming for Initial D 2 <頭文字D2>, the sequel to his 2005 Hong Kong action thriller Initial D <頭文字D>. Director Andrew Lau (劉偉強), who also helmed the first installment, confirmed that Hong Kong actor Edison Chen (陳冠希) will reprise his role as well. Since 2006, rumors have circulated regarding a sequel for Initial D, which was adapted from the Japanese manga and anime series of the same name. The earliest reports claimed that Jay himself would direct Initial D 2. However, there has been no confirmation on the final cast, and director Andrew Lau previously shared that the only details he could reveal were that Jay and Edison would return. Apart from Shawn, other actors that Jay is rumored to be considering are Hong Kong actor/singer Ekin Cheng (鄭伊健), Japanese actress Wakana Matsumoto (松本若菜), mainland Chinese actor Chen Daoming (陳道明), and Hong Kong actor Simon Yam (任達華). Hong Kong actor Anthony Wong (黃秋生), who portrayed Jay’s father in Initial D, is also on the list. 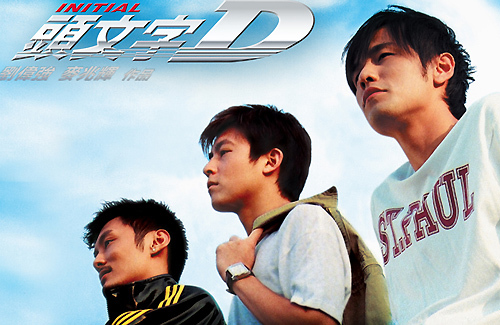 Initial D told the story of how tofu-delivery driver Takumi Fujiwara (Jay Chou) becomes an experienced auto racer. Along the way, he befriends fellow racer Ryosuke Takahashi (Edison Chen) and joins his racing team at the end of the movie. It is currently unknown how the storyline of Initial D 2 will pick up from the first installment. About time! I actually enjoyed the first one. Pls replace Edison Chen with someone else. first one is bad. second one mostly likely will be even worst. they should just make an original franchise instead of ruining the story from the manga. hk already have the legend of speed. y not make a good reboot? I remember switching to another movie after watching the first 10 minutes on the plane. Shinobi, played by Nakama Yukie and Odagiri Joe entertained me so much better than this faux Initial D during the entire flight. So do they speak in Japanese and film in Japan or something. I never read it or saw the animation,so Idk how this works.. Liked the first movie, it’s about time they make a sequel haha! Yup, actually like this film, three guys and soundtracks. Jay chou, let’s do a sequel. Just skip if the 1st one was already not spectacular. Sequels are “usually” worse. not a fan Jay! but i do like inital D so cant wait for the second movie with the original casts! yah excited!